The Chateys’ farm has a virtually unbroken history of distilling dating back to the early 1700’s. A large chestnut tree, The Smuggler’s Tree, served as the not-so-secret sales room in those days. Customers would leave a jug and some cash beneath the tree and return to find it filled with spirits. In 1919, the Chatey family purchased the farm. Distilling was a part of their Eastern European heritage; one which Prohibition’s advent could not curtail. It is therefore little surprise Louis would follow the family tradition…but it was a somewhat circuitous path. When Louis went to college, he did not major in agriculture or business. He majored in music composition. During those years, he met — and then married — Margaret Jordan, a farm girl from New Hampshire studying communications. Louis had a desire to return to the home farm and “do something with the land.” Margaret was in full accord. Louis studied winemaking at the International Wine Center in New York City and managed sales to corporate accounts for Sebastani Vineyards, Constellation Wines US, and Diageo-Guinness USA. In the 1980’s, he established a small vineyard on the family farm with the intent of making wine. A trip to Alsace, France changed everything. Margaret and Louis visited André Blanck, where they were treated to a framboise eau-de-vie. They immediately realized there was an opportunity in the United States for a fruit distillery, and the vision for Westford Hill Distillery was born. Back in the states, the Chateys connected with Jörg Rupf of St. George Spirits in California. A judge, Rupf had recently worked to pass federal legislation allowing the development of craft distilleries. Originally from Germany, he brought generations of European wisdom to his craft and blended it with novel techniques that eventually out-performed his European counterparts. Under his tutelage, Margaret and Chatey began learning the fine points of distillation. The Chateys built their distillery in 1995. They were licensed in 1997 and began selling their first eau-de-vie in 1998. Westford Hill’s eau-de-vie are decadent. It takes 300 bushels of apples to make one barrel of apple brandy. Five pounds of pears and cherries go into each seven-ounce bottle of Pear William and kirsch, respectively. For the framboise, it takes five pounds of raspberries for every ounce. The quantity of fruit is just the beginning. Quality is just as important. Only the highest Brix scores find themselves in Westford Hill spirits. For this reason, the Chateys, who pride themselves on purchasing 100,000 pounds of local fruit a year, cannot use locally-sourced raspberries or strawberries. In New England, the sweetest soft fruits only reach a four or five Brix. The West Coast berries can attain scores of 9, so those are the ones the Chateys purchase. All the fruit must be perfectly ripe and blemish-free, so the apples and pears are all hand-sorted before being crushed. The base wines from which the spirits are made are cold fermented at 60° F for two weeks — the pome and stone fruits. The soft fruits are allowed to ferment at 45° for four weeks to eliminate the “stemmy” flavor the seeds can impart. There is no such thing as hurrying the process at Westford Hill. Louis notes, “It’s not about oak; it’s about aging and maturing.” For that reason, they age in two-year old white wine barrels; new barrels “walk all over” the flavor of the spirits. Distillation occurs in a copper Arnold Holstein hybrid still. The steam-fired still cuts distillation time from a total of 16 hours in a pot still to one hour without compromising either alcohol content or flavor. It also cleans itself, thanks to the steam firing. Expect to wait if you order one, however. They are produced on-demand and require eight months to a year to complete. Waiting is something the Chateys know how to do. Nowhere does their patience and respect for the process shine more than in the creation of their apple brandy. As American as apple pie, native apple brandy used to be distinguished from the imports by the appellation “our brandy” in the old South. No examples of old recipes exist anymore, so creating a premium apple brandy that approximated the original has been a labor of love. The first task was to determine what varieties of apples would create the best result. As with every other stage of their endeavor, the Chateys sought to learn from the best. They contacted Thomas Burford, the orchardist who restored the orchards at Monticello and whose family has grown apples since 1715. Then they began experimenting, distilling and aging by apple variety. Each variety was blind tasted and evaluated. Which variety is the “best”? For aromatics, the Chateys have yet to find anything that surpasses the ubiquitous McIntosh. They also like many of the older varieties: Northern Spy, Jonagold, and Gravenstein. The influx of newer varieties is making it more difficult to source the old varieties, so the Chateys are continually testing alternatives. After eight years of experimenting with varieties and blends, Westford Hill released its first apple brandy, blended from four different apple varieties. Every couple years, they release a new blend, and each is unique. 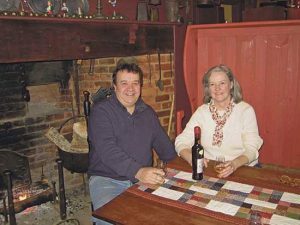 After 18 years Louis observes, “I’m still playing with the blend.” He must be doing something right: SLOW Food USA included Westford Hill’s Apple Brandy in their Ark of Taste, and the Smithsonian featured it in their History of Foods Series. Even a brief conversation with Louis demonstrates his commitment to creating the highest-quality spirits. While focusing on the product, however, he has not forgotten the old adage “Presentation is Everything.” The shape and type of bottles used, even the material for the labels, have been scrupulously designed. For example, research has indicated the majority of vodka is purchased by women aged 40-60. They asked their marketers to come up with something appealing to that age group. The result? A sleek clear bottle with frosting on the sides. Does it work? Let’s just say this 40-year-old woman immediately picked it out of the lineup! The Chateys are also unafraid to attempt the challenging or the uncommon. Their Poire Prisionnere continues the European tradition of selling pear eau-de-vie with pears grown in the bottle. First attempts to grow the pears in the elegant, heart-shaped bottles resulted in a mere 15 percent success rate. A local fourth-generation orchardist took on the challenge. He set aside a block of trellised dwarf pears just for the task. After petal fall, he puts the bull pear (the largest pear bud in a cluster) in the bottle and attaches the bottle to the branch below. Naturally, many things can go wrong: disease, insects, wind blemishes. His dedication has paid off. He now has an 85 percent success rate. Since the bottles spend months in the orchard, the Chateys needed to come up with a way to label the product. They settled upon textured peel and rub labels that earned them Best of Show out of 3,500 entries in the 2008 Los Angeles International Wine and Spirits Competition. For their other eau-de-vie, the Chateys chose to buck tradition and opt for educational labels. Most high-end spirits simply state the distiller and spirit name. After years of speaking with their consumers, the Chateys realized most people did not even know their spirits were fruit-derived. Margaret says, “We wanted people to understand there is real fruit in the bottle.” Each eau-de-vie label, therefore, sports a drawing of the fruit it contains. And, of course, the Apple Brandy had to have something special. Louis and Margaret wanted something to evoke an older era and settled on a woven label, much like those found in the back of high-end garments. This spring Westford Hill will be releasing the first of their new “Westford Series,” named for a local 1860’s glass manufacturer and bearing the sheaf of the original Westford Glass Company. Despite their success, Margaret and Louis do not sit back on their laurels. They are constantly experimenting — plum brandy, for example — and expanding. In addition to the products marketed under their own label, Westford Hill distills for other labels. They have plans to seed 8 acres of rye this year and perhaps establish a new vineyard in the future. For those who want to see the magic for themselves, the Chateys are adding a tasting room to their distillery and expect to be open for business in May. Take my word for it: it’s worth the trip.